2006 CAVCO WITH 1624 SQ.FT. LET US TAKE YOU ON A TOUR OF THIS BEAUTIFUL HOME. IMMEDIATE OCCUPANCY….This home is located in a nice gated family park. As you enter this home it feels very grand and spacious.The kitchen is just made for entertaining and/or family. A very desirable open home concept.The home has all new vinyl laminate wood flooring thought-out. It is very spacious 1624 sq. 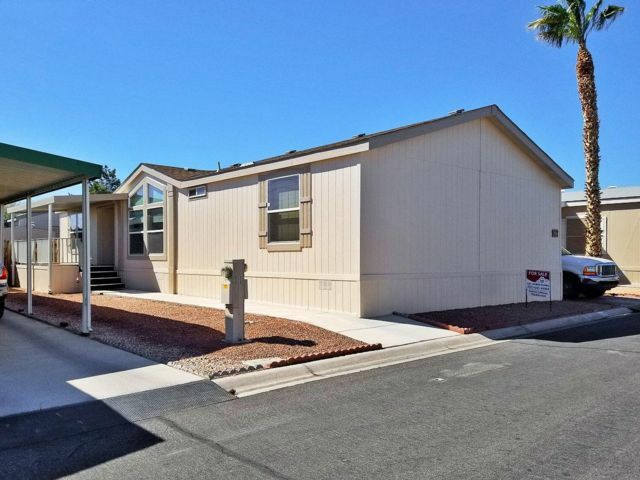 ft. and a perfect family size with 3 bedrooms and 2 bathrooms.This home has been freshly painted inside and outside, has a new hot water heater, double pane windows, 2X6 walls for energy saving and fans in all the rooms. All the appliances stay with the home including a new microwave. The air conditioner is serviced annually.The dining room measures 10X10, living room 19X13, kitchen 11X11 with lots of cabinets, master bedroom 13 x14 with a huge walk in closet, large tub and walk in shower. The second bedroom is 10 X13, the third bedroom is 10 X13 and 2nd bathroom has shower and tub. It has an exceptionally large laundry room and a nice wide hallway with linen closets at each end of the hallway….more storage. There is a large storage shed and parking for 2 cars under the carport.Now that I have given you a “Birdseye” view of all the details … you don’t want to miss this one!